We are clutching our sweets like excited kids on a day trip from school. The state of Saxony beckons and Captain Ber, along with Hotel Manager Janos Olah, have dispensed chocolates and candies to send us off “with energy” for our excursion. In a few hours’ time, when we have gasped at the spectacular Bastei rock formations and taken far too many photos of the Elbe from its most dramatic lookout point, we are welcomed back with warm scented towels and more care and consideration than I have ever experienced on any ship before. And if it happens to be raining, the crew will be lining our path on both sides with vast red umbrellas to keep us dry while we are boarding. There’s something special about Viking Beyla. 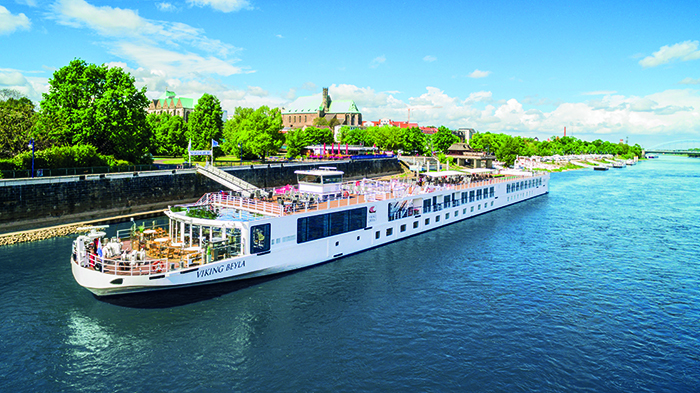 The river ship is the epitome of “small but perfectly formed” as it is only half the size of Viking’s superb 190-passenger Longships, and it was purpose built to navigate the extremely shallow waters between Berlin and Prague, which it can manage even when the Elbe’s levels are low. 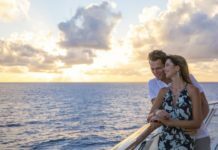 Constructed in 2015, this ‘baby longship’ carries just 98 passengers in 49 staterooms, which contributes to the friendly, more intimate feel on board. The ambience, congenial but never claustrophobic, is initiated by an accommodating, carefully chosen crew. There is a high degree of personal attention, with Programme Director Nancy Van Turnhout the star of the show. Warm-hearted, witty and tirelessly efficient, Nancy guides us every nautical mile of the way, from the Hilton in medieval Prague through to goodbye hugs at the Intercontinental in über-cool Berlin. Viking offers a variety of tours in both cities, as well as ample time to wander around independently. We spend two nights in Prague at the start of the trip, so in addition to an included city tour, guests can opt to enjoy lunch, private art collections, panoramic views and a concert at the gorgeous 16th-century Lobkowicz Palace within Prague Castle (don’t miss the Music room, with original annotated manuscripts from Beethoven and Mozart). 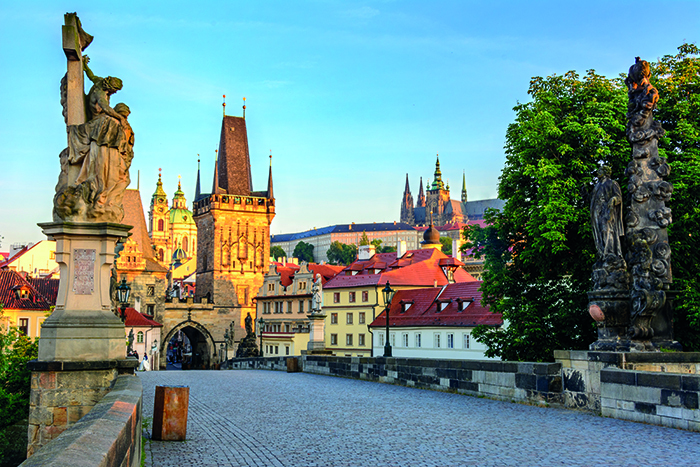 The Palace, as well as Prague’s most important landmarks, can also be admired on an illuminating two-hour evening tour, when it looks spectacular viewed from Charles Bridge. Alternatively, a rural folklore evening is also on offer in a nearby village, with a typical Czech supper, music and dancing (and lots of laughs), and Second World War buffs can channel their inner spy with Operation Anthropoid, an intriguing insight into a secret (and successful) mission to assassinate one of Hitler’s most powerful generals, carried out by the Czech resistance. We join our ship in the attractive town of Děčín, between Prague and Dresden in northern Czech Bohemia, and I am immediately aware that even though Viking Beyla is compact, it still boasts a substantial Observation Lounge and the same stylish, contemporary, Scandinavian design that is the hallmark of the Viking Cruises fleet. 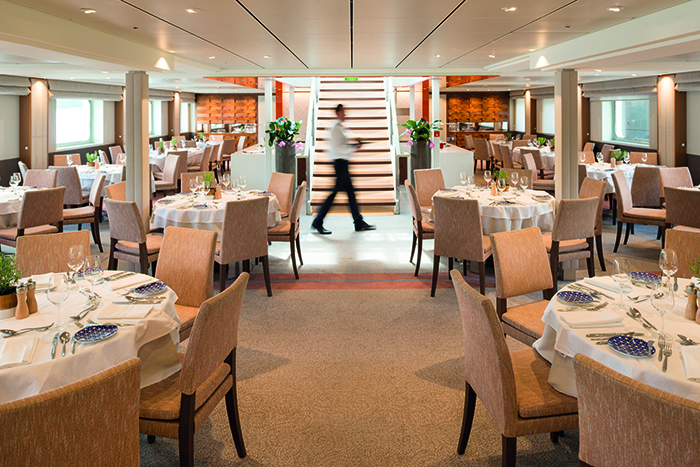 The signature Aquavit Terrace offers both indoor and alfresco dining, and although it lacks a pool and fitness facilities, there are plenty of loungers as well as canvas canopies providing shade up on the sun deck. My veranda stateroom is bright, airy and comfortable with ample storage space, floor-to-ceiling windows, a large TV (with a fine selection of recent film releases) a good-sized fridge, and complimentary wifi. I particularly like the heated tile floor in the bathroom with its low mood lighting at night – and the general emphasis on innovative lighting overall. Another treat is the balcony, complete with two chairs and a table, perfect for an early evening cocktail as the sun sets on these unspoiled shores. It’s a busy riverbank too, with cyclists following its flat path and families savouring scenic picnics. At 678 miles, the Elbe is one of Central Europe’s largest waterways, running from the Czech Republic through Germany to the North Sea. Following the Czech-German frontier it passes through the towering Elbe Sandstone Mountains, carving out the breathtaking Bastei rock formations, Germany’s Grand Canyon. Widely regarded as the most spectacular national park in the country, this 10-mile stretch of water is more commonly known as Saxon Switzerland, and is a UNESCO World Heritage Site. Our inclusive morning excursion here is comprehensive, with plenty of time allowed to leisurely stroll the well-maintained walkways and viewing platforms, while we listen with our Quietvox headsets to our guide’s stories of local culture and romance. We peer from the Bastei, the iconic 200-year-old stone bridge, and marvel at this geological wonder with its narrow gorges and deep ravines, trees that cling almost horizontally to the cliffs, and the Elbe contouring its way gracefully below us. 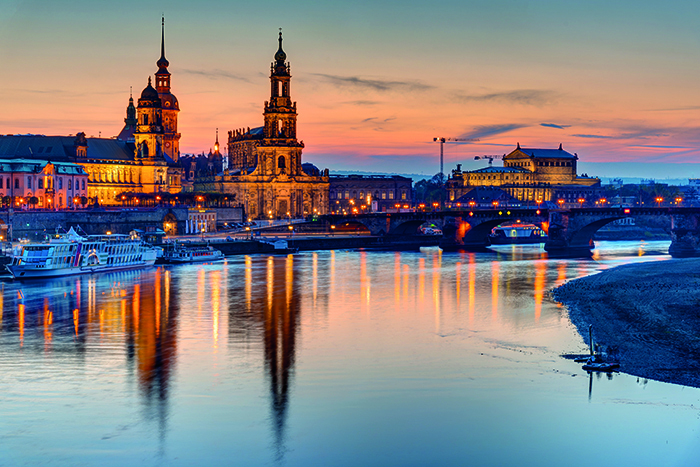 We are only a short distance from Dresden, the capital of Saxony, where we dock in the late afternoon. 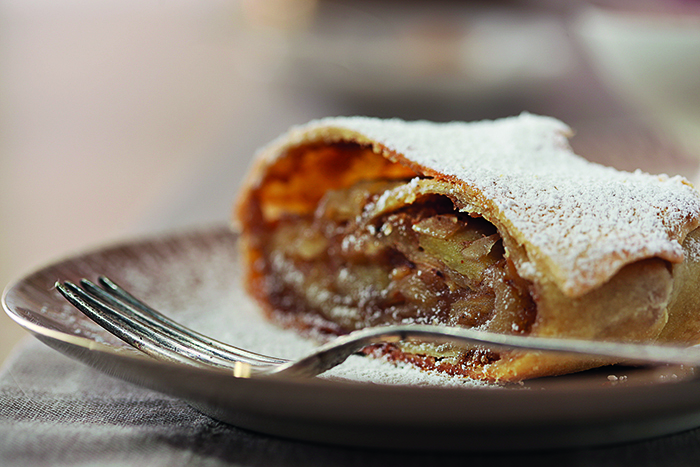 Dinner is a hearty German buffet, with a modern take on traditional fare; sauerkraut and schnitzel, giant pretzels and apple strudel, with our waiters sporting traditional dirndl dresses and lederhosen for the occasion. The food on board is appealing, well presented and full of flavour, with the accent as always on authentic local dishes, and a good range of well chosen, complimentary wines to match meals. The executive chef, Rene Nunez, uses lots of herbs from the organic herb garden on the sun deck (a lovely aromatic touch) and when he learned that I love crème brulée I was duly presented with a fine example – without herbs of course, but artistically garnished with redcurrants. 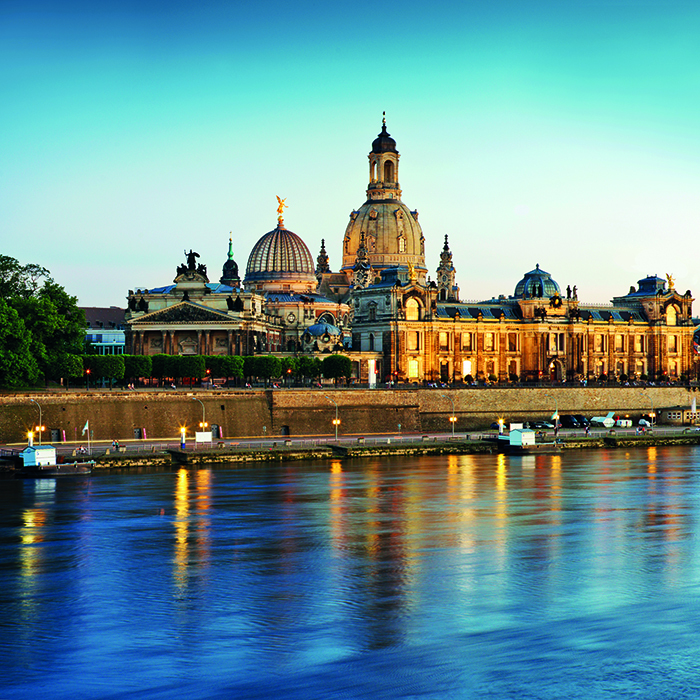 From a historical perspective, Elegant Elbe is an enriching and enlightening itinerary. We are escorted on foot around Dresden, nicknamed ‘Florence on the Elbe’ because of its strikingly elegant architecture, and I find it hard to believe that so much of it was destroyed by Allied bombings in 1945. Many of the stately buildings, churches and Baroque palaces have now risen again, and our guide gave us a very moving account of her upbringing there. There is an optional excursion to Dresden’s Semper Opera House after lunch, and after dinner we are treated to a classical performance in the style of the Saxon court’s royal chamber music. The historical highlights continue with visits to the famed porcelain factory in Meissen, a stopover in Torgau, where US and Red Army forces met at the end of the Second World War and an opportunity to walk in Martin Luther’s footsteps around his hometown of Wittenberg, birthplace of the Protestant Reformation. 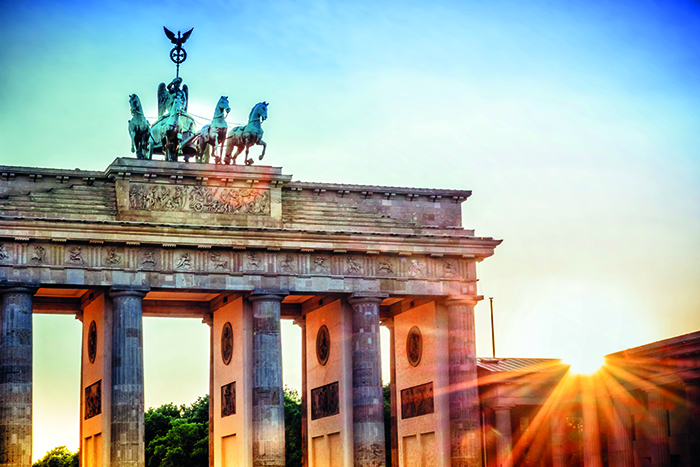 And when we disembark for our coach journey to Berlin, the fun doesn’t stop there – we pack in more opulent palaces and pretty gardens in Potsdam and Worlitz, including a visit to Frederick the Great’s summer home, the majestic rococo palace of Sanssouci. And so to vibrant, cosmopolitan Berlin. The land portion of our journey is handled as well as the cruise, and our bus tour of the German capital takes in a visit to Checkpoint Charlie and the site of the Berlin Wall. Almost three decades on from its fall, standing in front of it is still an intensely emotional experience and there are a number of optional excursions offered should I want to delve deeper, including a visit to the Sachsenhausen Concentration Camp; Museum Island; and a ‘Divided City’ two-day tour to witness Berlin’s Cold War past. It has been a remarkable 10 days: a generous taste of cities and cultures, and we’ve been entertained as well as better educated (I have even refreshed my schoolgirl grasp of German, which pleases me greatly). My fellow passengers feel the same, and I’m sure it won’t be long before we meet again on another Viking river cruise. GETTING THERE: A 10-day Elegant Elbe itinerary starts from £3,595pp, including all meals, wine or beer with lunch and dinner, and eight guided tours. 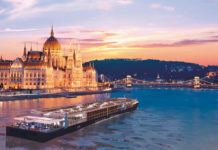 For more details, call 0800 319 6660 or visit vikingrivercruises.co.uk.